Toward the end of a Texas summer, I begin to notice something unflattering about myself. At first I blame it on the dryer. Then on my cheap cotton shorts. But by the time it’s cool enough to reach for the skinny jeans I wore comfortably all winter, my suspicions are confirmed: I got a little fat. It makes perfect sense when you understand my absolute disgust of the Texas heat. While my friends in cooler climates have been playing church softball or going on night walks, I have staged a boycott against the great outdoors. This involves lounging around our 72° living room, wearing sweatpants, and sipping margaritas. Not exactly the recipe for svelte. Which is why I may be the first food blogger to write not about getting that perfect bikini bod, but preparing to eliminate those newly-acquired love handles before sweater weather arrives. For me, that means more awareness of what I’m eating (a week or two of tracking my meals in an app like My Fitness Pal seems to help) and finally venturing back outside. It starts tonight, with this meatless favorite and a big salad. And (perhaps) a night walk. After all, there are only a few months before the holiday fat pays a visit—and I plan to ask for a chef’s knife, not bigger pants. A few years ago, Jason asked me out of the blue, “What are falafels, and can you make them sometime?” He imagined something sweet and deep fried—a “fair waffle,” he would later explain it—similar to a funnel cake or elephant ear. Instead he got these. Not quite as delicious as a fair waffle, but a good dinner nonetheless. Place drained chickpeas, parsley, and garlic in the bowl of a food processor. Pulse until chickpeas are coarsely chopped (not puréed) and no big chunks of garlic remain. Pour into a large bowl. (Alternatively, use a fork to smash chickpeas in a large bowl, then add minced garlic and parsley.) Add egg, lemon zest, cumin, coriander, salt, pepper, and panko. Stir to combine. Heat oil in a heavy-bottomed skillet (I use a 12″ cast iron pan) until shimmering. Form chickpea mixture into eight small patties (they will be a little crumbly, so pack them tightly!) and transfer to hot skillet. Cook over medium heat for 3-5 minutes per side, flipping once, until golden brown. (Try not to shuffle them around in the pan too much; they’re prone to fall apart with too much poking.) Remove from skillet and drain on paper towels. Serve warm with pitas, fresh vegetables, and tzatziki (recipe follows). Confession: I’ve made this recipe dozens of times without learning how to pronounce it. I finally Googled it tonight and feel compelled to share my findings. So here it is: sat-SEEK-ee (or, in Greek, chah-CHEEK-ee). You can also listen to it here. You’re welcome. Grate the cucumber on a box grater, using the smaller holes. Transfer to a clean kitchen towel and wring of any excess moisture. Combine with remaining ingredients in a medium bowl. 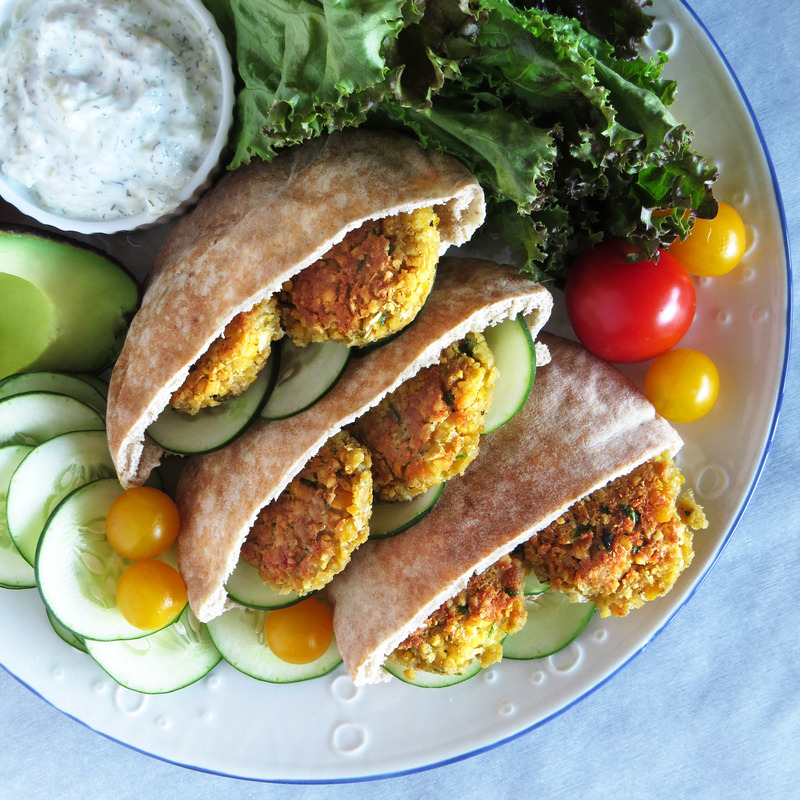 Serve with falafels or as a healthy vegetable dip.